Behold the power of the internet. A couple of months ago a Texan who goes by “USMA89” contacted us and said he was interested in a 6BR to complement his stable of .308s and heavier calibers. Starting with a discounted Rem 700 action available from GA Precision, USMA89 worked out what would make the ideal 6BR “fun gun” for prone shooting from 100-1000 yards. USMA89 sourced the recommended components, including a Broughton barrel and a beautiful Robertson stock. 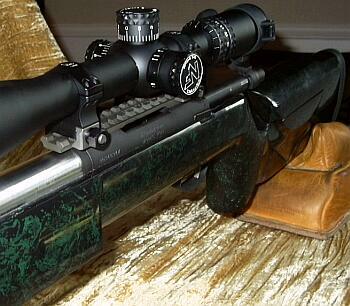 The result is a handsome, ergonomically perfect, low-recoiling rifle with accuracy you have to see to believe. This project all began as a bargain hunt. You see Brownell’s had a sale on Remington 700 actions for $250.00. I had to have one–What a great deal! The only problem was that George Gardner from GA Precision bought every action they had. He offered to sell the action at cost, but it would have to be chambered and trued by his shop. George has a great reputation for tactical rifles, so I thought I would take a chance and start another project. Next, I had to pick what caliber to build. I was surfing SnipersHide.com and found quite a bit of praise for the 6mmBR cartridge. From there, I was referred to 6mmbr.com. I was looking for a new long-range project with great accuracy, but less recoil. 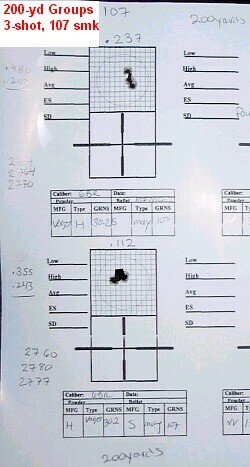 My 300 Remington Ultra Mag Ackley Improved was getting hard to shoot after 20 or 30 rounds. Most of my shooting was going to be at the 500 and 600-yard range. After talking with “the Moderator” here at 6mmBR.com, I chose to build a 6BR. A word about the barrel–I have had many custom barrels over years, but since this was going to be a new project, I decided to branch out on barrels. I have had very good luck with Krieger and Hart barrels, but decided to go with a #7 contour, 1:8 twist Broughton barrel. Broughtons have been doing very well in competition lately so I hoped it might deliver exceptional accuracy. In general most of my rifles have McMillan stocks. I have seen a few Robertson Composites stocks at the range and admired the work that went into each stock. These stocks are works of art. Talking to Ian Robertson on the phone was a great. He helped me through the process and talked me out of a couple of options that would have added more to the price, but I would not have used. The only problem was that I am in Texas and he is from Canada. We could not always understand each other with me saying “ya’ll” and him adding “Eeh” to every sentence. In the end we decided on the original F-Class stock with a 3″ forend. I went with a green and black marble swirl, the colors of my son’s high school football team. I also added a 10-ounce Jewell trigger to the mix. 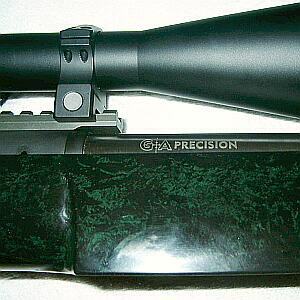 The rifle features a Remington 700 action, completely trued by GA Precision. 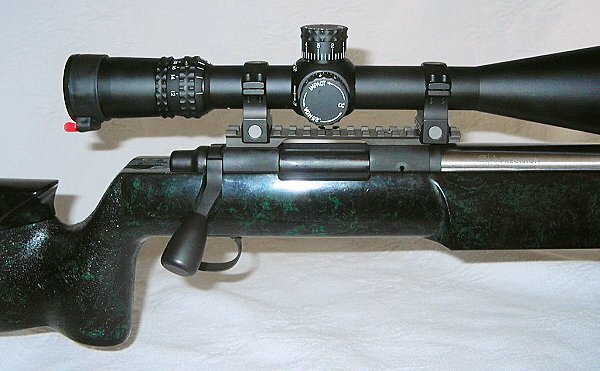 The Broughton 28″ barrel was chambered for no-turn Lapua 6BR brass. After some discussions with the Moderator of 6mmBR.com, we wanted a freebore of .085-.090″ in order to use the 107gr Sierra bullets, but still be able to reach the lands with shorter bullets, such as the 87gr Hornady V-Max. George Gardner had just received a new .272″ neck, .088″ FB, 1° 30 leade reamer from Dave Kiff of Pacific Tool & Gauge. I have all most of my barrels threaded 5/8×24 for suppressor use. This rifle is no different. In most countries outside the United States, it is considered rude to shoot without a suppressor. I am a firm believer that a good suppressor, in this instance an SWR Omega, helps with accuracy and general gun-handling. First there is the recoil reduction–felt recoil with the suppressed 6BR is that of a 22 magnum. I also believe the can reduces “dirty” or unstable air behind the boat-tail bullet. There is some controversy with this theory, but I know I shoot well with the suppressor in place. During initial testing, it did not like the Berger 68s all that much, going about 1″ at 200. I think there is more potential there but I haven’t had time to play with loads and seating depths. Frankly, my interest in the 68s has waned because the 107 SMKs are magic, consistently going under 1/2″ at 200 yards. And the 107s hold their accuracy at long distances. I was able to shoot clays at 500 with relative ease. I did not take pictures of my groups as I was out at TACPRO and we were just having fun. I was able to hit an 8″ spinner without a problem at 500 yards in high winds using just a data sheet for come-ups. The wind calmed down a bit and after a couple of adjustments I hit a 18″ steel plate at 1000 yards with no problem. This gun just plain shoots. Developing a load was embarrassingly easy–I just followed conventional wisdom, running 30.0gr Varget, seated to “kiss the lands”, then later bumped it to 30.2. I did not do anything special, just expanded the neck with a Sinclair expander, threw the charge with my Harrell and seated it with my new Forster dies. I feel that the accuracy of the gun is due to the forgiving nature of the cartridge and the fine work that went into the building of this rifle. I stick with the basics with reloading. These are a couple of things that help me out. With an extruded powder like Varget, I like to use the Lyman 1200 DPS electronic measure. I bought the measure before the Digitial Dispenser review favoring the RCBS ChargeMaster, but the Lyman still works great for me. After neck-sizing the brass, I run the brass through a 6mm Sinclair neck expander. I like to keep the same neck tension on every bullet. The Robertson F-Class stock is beautifully finished, it fits my 6’4″ frame perfectly, and it is very comfortable to shoot. The cheek-piece is comfortable and the adjustment works perfectly. Everyone who has seen the gun has remarked on how nicely the stock is finished. The two-tone gelcoat rivals an expensive paint job. The geometry is excellent–the underside of the fore-end is flat and smooth and the fore-end sides are perfectly parallel. There was a bit of trouble in fitting this stock to the action. No fault of the stock, action-maker, or gunsmith. This stock was designed for a custom flat-based action like the Stolle or BAT. The action sits well down into the stock. Consequently some additional inletting was required to allow the standard Rem 700 safety to function properly. GAP also had to relieve an area behind the tang for bolt clearance. If I were to use another 700 with this stock, I would first sleeve the action. This all being said, GAP did a wonderful job on the entire rifle, the stock looks and feels great. One of the other reasons for choosing a Remington 700 action for this project is that I had an extra Badger 20 MOA base and NightForce titanium 30mm rings already in hand. I used this to mount a NightForce NSX 12-42 R2 scope. I rarely use more than 22 power, but the NSX at 42-power is like having a built-in spotting scope. Shooting with a suppressor or “can” is a great experience. In fact, once you start shooting with one, it’s hard to go back to normal shooting. The recoil reduction is amazing, cutting perceived recoil by as much as 70%. Think of a sound suppressor as the ultimate muzzle brake that reduces noise to boot. The cost of a good suppressor ranges from $600-$1000, and then there is the $200 to Uncle Sam for the tax stamp and the 3-6 month wait. 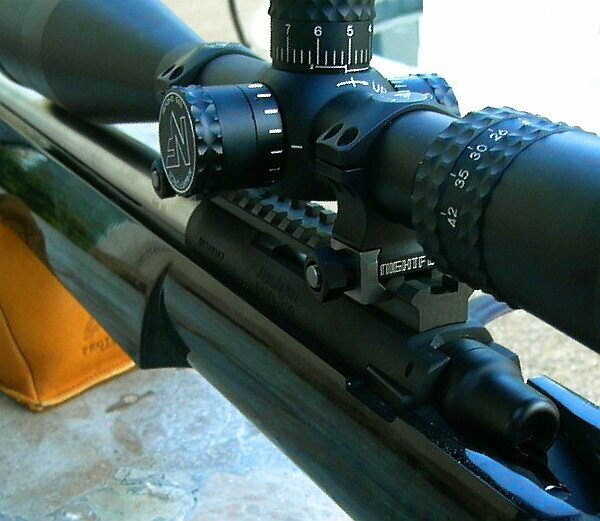 The suppressor on this gun is an SWR Omega, considered one of the best. I also use an SRT suppressor and am very pleased with it as well. The SRT costs about $300-$400 less than the SWR and you get the same amount of sound reduction. With a quality suppressor you can get from 33 to 36 db worth of sound suppression. Once you have gone though the hoops the government has put in your way (check your state laws also! ), mounting is easy. Get a good gunsmith to thread your barrel (5/8×24 is the normal Class III thread) and screw it on. Normally, suppressed guns’ barrels are cut shorter for balance. 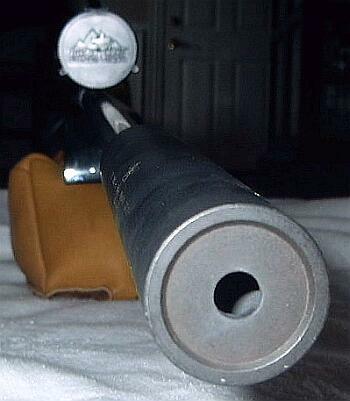 .308 barrels are usually 18-20″ with the can being around 6″ long. This would make the gun with the can about the same length as a standard PSS. Most subsonic rounds (EBR, Blackhills, TTI) are loaded for this 20″ barrel length. I went with a 28″ barrel and with the can it is a little front-heavy, but the stock’s wide fore-end compensates for this. If this were a “tactical” weapon, I would have the barrel cut down to at least 22″, maybe less. Most people that use suppressors will tell you that they shoot better groups with a can than without. This is because there is less recoil, less ‘dirty air’ behind the bullet, and (in many cases) you get improved barrel harmonics. The last two items are the subject of some controversy, but I am a believer. If nothing else, the suppressor looks cool and the noise reduction is even cooler. If you’re in the market for a suppressor, check out SilencerTests.com. That site contains very detailed specifications of all the major silencer brands, including weights, dimensions, and decibel ratings. The suppressors were tested in accordance with MIL-STD-1474D using calibrated military-approved sound-measuring equipment. You’ll find a wealth of information on virtually every brand of suppressor readily available for sale in the United States. Being known as a .308 guy at my local range, lots of guys have asked me “How do you like the 6BR?” In short, I love this round. The rifle tracks better than any of my other rifles due to the design of the stock, the recoil is less, and the 6mm bullet flies flat and true. This is my first 6BR, but not my last. The recoil is a third of the .308 and is in a different universe than the 300UM. The gun exceeded my expectations. I would build a gun with GAP again. My next 6BR will most likely be a full-race F-Class gun from Speedy Gonzalez at S.G.&Y Precision, who has done quite a few guns for me in the past. I have two more 6mm BR projects in mind: a full F-Class gun on a custom action, and maybe a full tactical model. The F-Classer might use a Dasher or improved round, and we’d look for a mag-feed solution for the tactical model which would be built by GA Precision. I also hope to try some of the factory ammo in my GAP 6BR. Initial reports say it’s excellent. Stay tuned for more details. * Editor’s Note: You can see from the target photo that USMA89 figured group sizes by subtracting .243″ nominal bullet diameter from edge to edge measurement. We’ve found that 6mm bullet holes in paper are usually around .220″ in diameter. On this site we also normally try to measure groups center to center when possible. This avoids uncertainties involving the gray area surrounding the hole. Measuring that “wallet group” more conservatively with a .220″ bullet hole would increase the group size by 0.023″ to 0.135″–still pretty amazing for 200 yards. All Content Copyright © 2010, 6mmBR.com | AccurateShooter.com, All Rights Reserved. Topics: Remington, Rem 700, George Gardner, GA Precision, G.A., GAP, Kreiger, Robertson, Ian Robertson, Robertson Composites, F-Class, stock, 6mm, 6BR, 6mm BR, 6PPC, 6 mm Benchrest, Benchrest, Belly Benchrest, Tactical, precision rifle, hunting, varmints, varminting, silenced, silencer, suppressor, suppressed, Can, sound reduction, SWR Omega, SRT, decibel, rifle accuracy, guns, 6mmBR, 6BR, 6 Dasher, .223, 223 Rem, Ackley Improved, Hodgdon, Varget,Krieger barrel, Jewell trigger, Fiberglass, training, reloading, powder selection, case forming, fire-forming, Lapua, Sierra, 107, Match-King, 87, V-Max, Hornady, bullets, gunstock, stock-making.